Get ahead of holiday weight gain! If you’re looking to get proactive by shedding a few pounds before Thanksgiving Day rolls around, give my “3-4-5 Plan” a try. The rules are simple. In the morning, enjoy any breakfast that's under 300 calories, eat lunch for no more than 400 calories, and eat a dinner that's 500 calories or less. You can create your own meals and menu or choose from the nutrient-packed recipes we've customized here. Also, in addition to your three meals, enjoy one to two snacks each day. We've included a handy smart list for inspiration. Mixed greens topped with 4 - 5 ounces protein (chicken, turkey, salmon, shrimp or tofu), ½ cup beans, and unlimited non-starchy veggies. Dress with 1 teaspoon olive oil + unlimited vinegar or fresh lemon juice. Alternatively, you can use 2 tablespoons low-calorie vinaigrette. 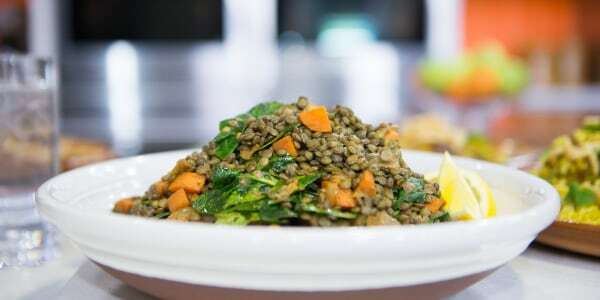 2 cups of lentil, black bean, or hearty-vegetable soup + salad layered with non-starchy veggies and dressed with 1 teaspoon olive oil and unlimited vinegar or fresh lemon juice. Alternatively, you can use 2 tablespoons of low-calorie vinaigrette. Love cooking in a Crock-Pot or slow cooker? Try this delicious Chicken Curry and Vegetables or Slow Cooker Chicken and Black Bean Chili. Enjoy a hearty turkey burger on ½ bun with lettuce, tomato, onion and a squirt of ketchup + 2 cups steamed or roasted vegetables or try a salad dressed with 1 teaspoon olive oil and unlimited vinegar or fresh lemon juice — alternatively, you can use 2 tablespoons of low-calorie vinaigrette. Try other variations like a Turkey Black Bean Burger or Turkey-Spinach Burger. Enjoy 2 servings of cauliflower fried rice + 4 ounces cooked protein of choice such as shrimp, fish, chicken, tofu, pork tenderloin, lean steak or poultry sausage mixed into the rice. 5 ounces grilled, roasted or baked fish (cooked with 1 teaspoon olive oil, fresh lemon juice, salt, pepper and preferred seasonings) + 2 cups steamed broccoli and 1/2 baked sweet potato. If you really love fish, try this Grilled Asian Salmon or Tilapia with Spicy Tomato Pineapple Relish. Use ground coffee or K-cup pods. Add splash of skim milk and a dash of pumpkin pie spice. You can also froth the milk with a milk frother for an extra tasty touch. Pop 4 cups of light popcorn. Mist with oil spray and add a dash of pumpkin pie spice. This post was originally published on Sept. 20, 2017.